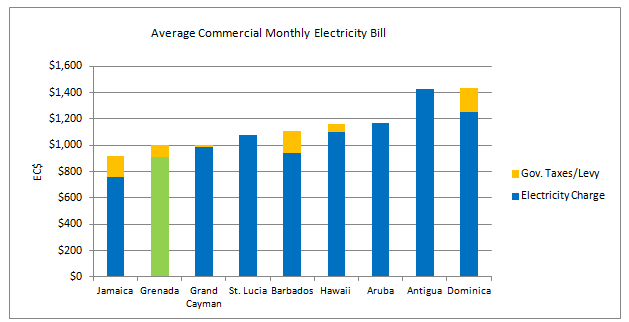 Grenada’s current average residential electricity price at EC$0.63/kWh is on par with other Caribbean islands. On a much larger scale, with a population more than 10 times greater than Grenada, the U.S. Hawaiian Islands’ residential rates are EC$0.80 to EC$0.95/kWh. 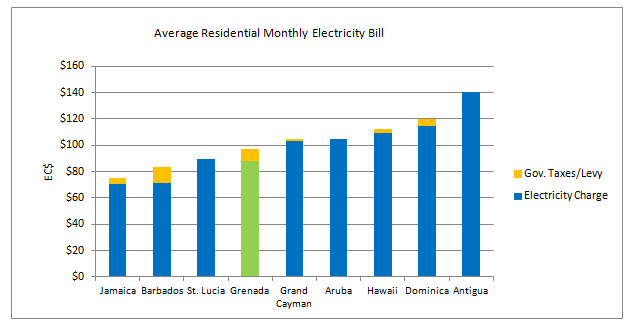 The average monthly bill is based on Grenada’s average residential monthly usage of 141 kWh/unit. Data: April 2016 The above information was gathered from various electric utilities. The average monthly commercial bill is based on a facility with a demand of 10 KVA or 2,500 square feet. Data: April 2016 The above information was gathered from various electric utilities. Fuel charge has decreased by 51.7% (from $0.5419 to $0.2620 per kWh) since November 2014. Non-fuel charge has decreased twice: 3.2% effective 1 November 2014, and 2.35% effective 1 January 2016. Over the last 22 years, the non-fuel charge has decreased in real terms by 33.3% when adjusted for inflation. The combined effect of lower fuel costs and non-fuel charges has resulted in a 33.6% reduction in overall electricity prices since November 2014. Electricity rates are at the lowest level since 2007.